Our product range includes a wide range of hydraulic die spotting press. 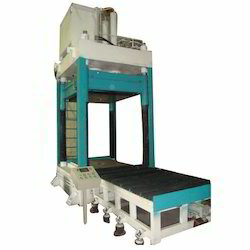 Die spotting presses are used with various applications, especially for the verification and manufacturing of molds and dies. In adddition to the dimensions defined according to the mold or die to be proved, the required force is generally lower than in production pressses. These items focus on checking the contacting surfaces between the lower and upper parts of the die. Spotting presses are also defined by their exigent characteristics when it comes to stopping and guiding positions. Next, molds are less exigent in guiding, with column guides normally being used. On the other hand, the general recommendation is to add tilting devices in both the bolster and slide, which will improve the ergonomics of skilled workers who are fitting the mold.